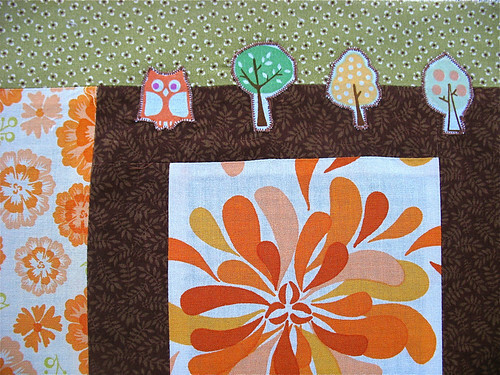 Quilt block number two - Stop staring and start sewing! Well I'm trying to play catch up here, so today I was finally able to put together a quilt block for Jessica. 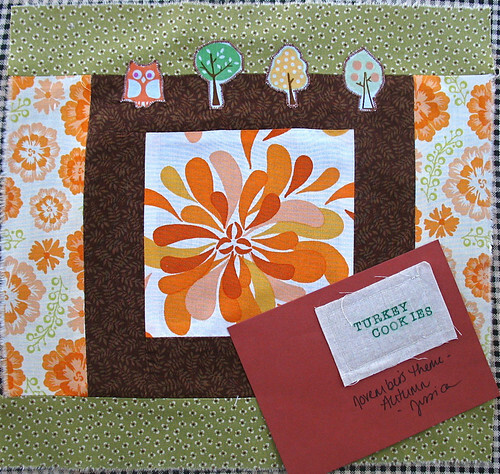 November was her month for a quilt block in our Twelve Square group so I'm a little behind. Her theme was "autumn" and I think I pulled it off. Here is the block I came up with. I added some of Sandi's Farmers Market prints (on sale now!) to the fabrics Jessica sent because the colors are just perfect for autumn. Here is a close up of the little appliques I added (it looked a little plain before). I used bits from my Pottery Barn pillowcase (a very fun print and I'm getting a lot of mileage out of it!). For December I'm doing a block for Kristena, who's theme is "scrappy log cabins". Fun! Here's what she sent. Some of the other gals already have this one done so you can check them out at our Flickr group. 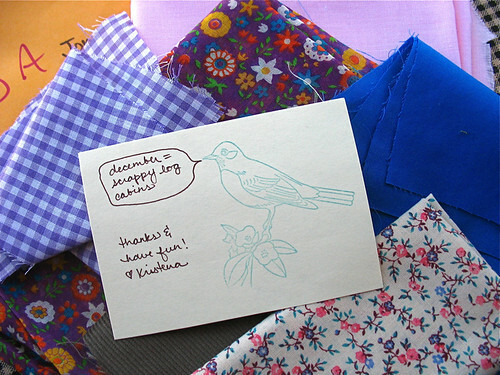 And I had a chance to play with some of Kaffe Fassett's new fabric. 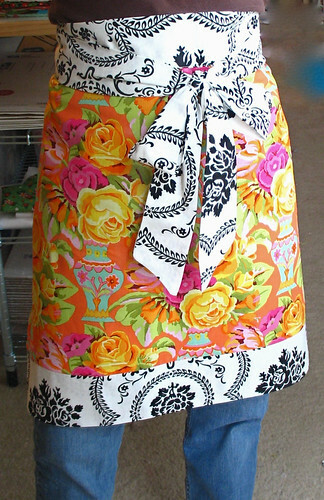 I made this fun hostess apron for a dear friend and I think it turned out great with the Sis Boom print accenting it (and it took less than an hour from start to finish!). Snappy! Oh, and I am sad to report that my wonderful cheap plastic invisible zipper foot lived up to it's description (the "cheap plastic" part) and broke on the 3rd zipper I used it for. I was able to finish the zipper okay but the foot is toast. On the bright side, I now realize I really do need to get an official metal invisible zipper foot because it makes the job so easy (it makes me "want" to put zippers in things and that's huge). So it wasn't a complete waste of 2 bucks.